AS THE city continues to grow so do our needs for transportation and support services. A relative newcomer to the city is The Airport Flyer, taking local passengers to and from the international and domestic airport as well as those setting sail from Hamilton Wharf. Coralie and Gary Roll is the husband and wife duo who are on the ground with the day to day operations of the business. "We have five directors in the company. My father Ken Morgan, sister Lea-Anne and husband Colville Smith. We all work well together ," Mrs Roll said. 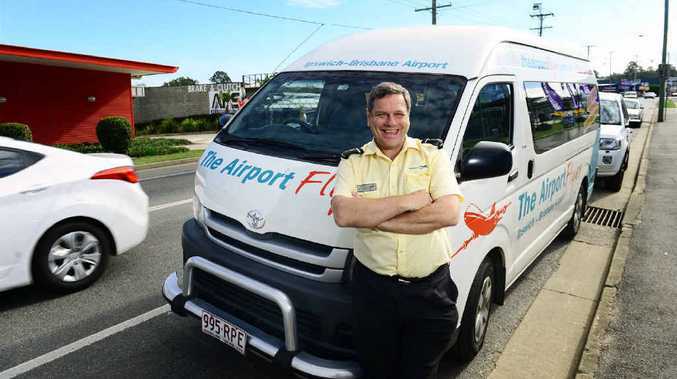 While The Airport Flyer, as a local service, is well known in the Toowoomba community, it has expanded in February this year to take in Ipswich and surrounding areas. Currently it has a driver and bus based in Ipswich. "We have a second driver and bus ready to go so we are expanding our service and that is in response to the demand. Gary has been driving the bus in the early days to get the service off the ground," she said. The business operates a scheduled service and customers are given a pick-up time and set- down time. It is a home pick-up service and the scheduled services get passengers to the terminal well on time for departure. There is a half-hour bracket of time given so passengers are ready to be collected. "This type of service is well received and it is a cost-effective way of operating for our customers. We pick up from people's home, motel or business." The feedback to date is confirming how much this type of service is needed. "A high percentage of people do travel for work, we have a lot of fly in fly out workers. We offer our regular and frequent travellers a Multiple Advanced Purchased (MAP) voucher, this will save our customers up to 40 per cent," she said. There is no need to wait on the phone, The Airport Flyer offers an online booking system so you can book anytime, up to 12 hours prior to collection. "We do have an after-hours number for immediate or last- minute bookings so we can cater for all needs. Customers just call our standard number and will be directed to that service. "We do cater for groups and special requirement services. If you have a special requirement then please just call us. We do charter services and group bookings. We do take people down from Ipswich to the Gold Coast for special flights, these are not part of our scheduled service, but we can cater for that," she said. For people living in communities in centres such as: Laidley, Boonah, Fernvale and the like, then good news, The Airport Flyer will do home pick-ups. There is a small additional charge on top of the normal fee, but it is still a cost-effective way of getting to and from the airport or shipping terminal. The service has grown to a staff of 30 in Toowoomba with 10 vehicles on the road. Ipswich now has two drivers and buses on the road. Currently there are seven services a day. To find out more or to book phone 1300 30 43 50 anytime, the website is at theairportflyer.com.au and search "the airport flyer" on Facebook.